Iron Man is a toy company's dream, because you can basically create any kind of new armor you want for him and it's totally consistent with the character. Unlike, say, Batman, Iron Man's not married to a style designed to hide in the shadows, and unlike Blue Beetle or Green Lantern, he's not defined by any one color. And you know Tony Stark watches movies for inspiration. In the case of this newest Hot Toys figure, he's been inspired by a fellow Disney-owned property. Officially, this figure is called "Neon Tech Iron Man." Unofficially, it's "Totally-Tron-We-Just-Can't-Call-It-That Iron Man." And yes, he lights up. It might be too blatant for him to come with a disc; even though Tron and Marvel could totally work out a deal under the Disney banner (look at what Kingdom Hearts just did), official licensing still costs more. But he has frickin' lasers, people. He also comes with two different sets of forearm armor and multiple hands. Hmm, should we change his name to Tony "Sark"? Nahh, Sark was red. Which is Iron Man's usual color, funnily enough. 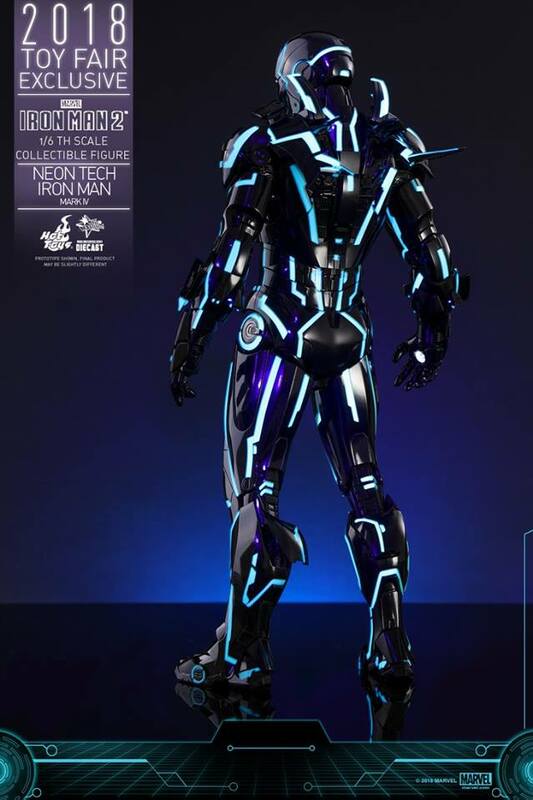 This Iron Man figure will debut at Hot Toys' flagship store in Shanghai Disneytown Lakeshore--Shanghai Disneyland being home to a Tron rollercoaster, of course--and at CCG EXPO 2018. You can probably expect him to show up at San Diego Comic-Con International and other summer conventions as well. No price tag is specified yet, but like most Hot Toys, you can probably expect something in the $300 range. Totally worth it, though. Is this Iron Man variant going on your grid? Let us know in comments. Gentle Giant's Concept Yoda SDCC exclusive is wild. A delicious looking Bao Funko figure. This Popeye figure is strangely realistic.